The Roman Forum, the heart of Rome. The citizens of ancient Rome spent a good part of their days there. The great place was surrounded with temples and legal buildings and filled with statues, bridges, arcs and columns. So the "Forum Romanum" was a remarkable marketplace center point for all business and shopping made by the ancient citizens of Rome. The Forum was also used by Roman orators for public speaking. This created a shopping and trading ambiance that would get people stopping and listening. Many religious and festivals where also held at the Forum. It is also known to have been the cradle of the Latin population 26 centuries ago. The creation of the forum, as market and public meeting space, was a roman integration of the Greek's agora. Forums also made their appearances in many other towns and Italy provinces. The "Forum Romanum" extended along side of the Palatine Hill in front of the Capitoline Hill. It was of a rectangular shape and had around it: shops, public treasury, a basilica, the Roman curia and a prison. The forum extended almost to the coliseum (colosseum) when the Constantine Basilica was built. A small bridge crossed the small stream that was flowing towards the Tiber. The temple of Saturn, which housed the treasyry, as well as the Temple of Concord where located in direction of the Capitoline Hill. The Arch of Augustus, west of the forum, was one of the entrance. South of the Forum was the temple of Vesta near the house of the vestal virgins. The Arch of Septimius Severu closed the Forum northwest. 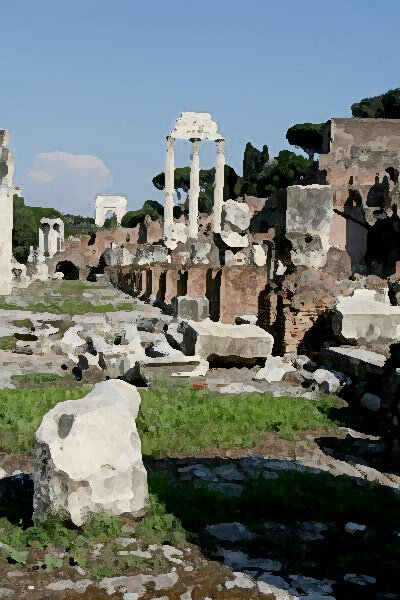 In the imperial ages, the forum became obsolete compared to emerging and more modern forums that were being built elsewhere in the city and in the 4th century, fires, earthquakes, and barbarian invasions eventually destroyed most of the forum. Materials and stones from the Forum Romanum were used to build new monuments during the Middle Ages throughout the city of Rome. Archaeology and excavations were only being made since the 19th and 20th century to re-discover what was left of the forum. The forum, which is part of an impressive complex of ruins that includes the coliseum and the Palatine, is part of what testifies today the magnificence of the ancient Rome.